Basing on the materials of the research in the field of territorial planning and urban development, as well as on his personal research and design experience in territorial and urban planning within the so-called nonmetropolitan practice, the author of the article gives concrete examples of this practice and evaluates them. Belkina, T. D. (Scientific ed.). (2011). Sostoyanie gorodov Riossii 2010: programma OON-Habitat [The state of Russian cities 2010: UN-Habitat Programme]. Moscow: Nauchno-issled. Nekommerch. partnerstvo “Gorod-Region-Semya”. Zaborova, E. N. (2014). Gorodskoe upravlenie: uch. posobie [Urban management: textbook]. Yekaterinburg: Izd-vo Ural. Un-ta. Zubarevich, N. V. (2012, December 20). Sotsialnaya differentsiatsiya regionov i gorodov Rossii [Social differentiation of the regions and cities of Russia]. Gumanitarnye tekhnologii. Retrieved from http://gtmarket.ru/laboratory/expertize/6849. TOVMASYAN, Eduard. It Happens in the Cities and All Over Russia. project baikal, Russian Federation, n. 52, p. 53-55, june 2017. ISSN 2309-3072. Available at: <http://www.projectbaikal.com/index.php/pb/article/view/1162>. Date accessed: 18 apr. 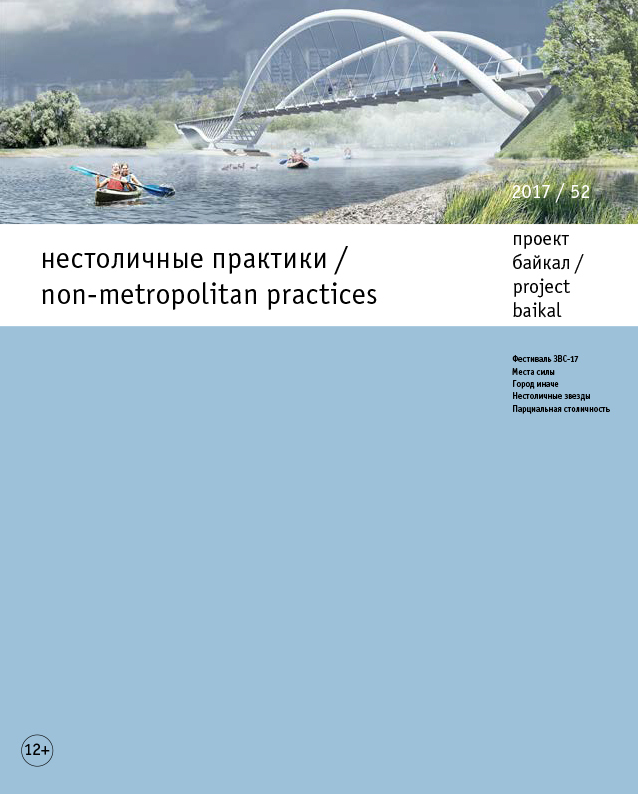 2019. doi: https://doi.org/10.7480/projectbaikal.52.1162.